Published Mar 1, 2018 by Addison-Wesley Professional. Part of the LiveLessons series. "Excellent material. I really liked these videos, that aren't only about learning language features, but also about understanding abstractions and discussing software design." Almost 8 hours teaching Java programmers how to design and create Java code using functional programming style and the new language features added with Java 8 that support that style. 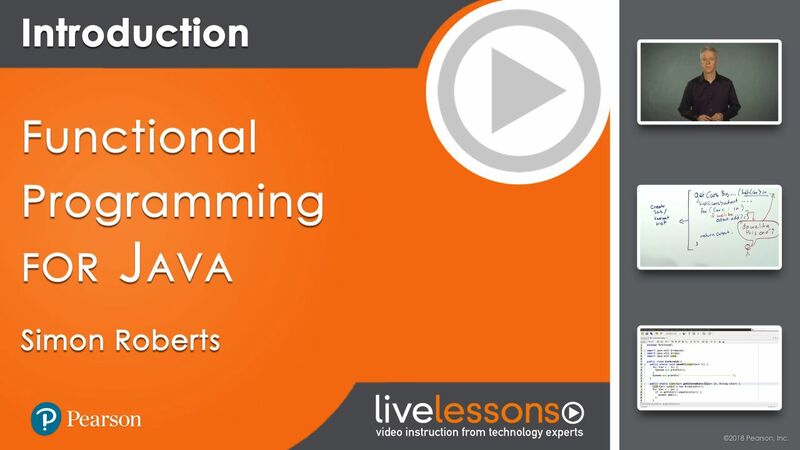 Functional Programming for Java LiveLessons provides a solid foundation for designing and creating Java code using the functional programming style. Simon Roberts, best-selling author of Java Certification and programming books and video titles, has created a unique video course using live-action lectures, code demos, and whiteboard instructions to take learners on a learning journey by telling a story. Functional Programming for Java LiveLessons is a complete resource where each new concept is introduced gradually, based on examples that start in the familiar object-oriented style. A solid foundation is created before adding on more complicated concepts. The discussion then examines how this example might be improved and introduces functional concepts in small steps, building in relevant code as you go and in a way that emphasizes understanding. Exercises are suggested throughout, allowing the viewer to stop and try solving the examples on their own before continuing. The code for this course is available as a GIT repository and viewers are encouraged to work with it to further their understanding. Handle exceptions, both checked and unchecked, in Stream processing, and other situations where exceptions would break the system either compile or runtime. Java programmers who are finding functional features being used by their teammates, and who want to understand both the syntax being used, and the design patterns that are being implemented by those features. OO programmers looking to learn the functional approach, who write in languages that have sufficiently similar syntaxes, such as C#, C++, and so on. Learners should have a reasonable grasp of Java, or a solid grasp of another object-oriented programming language with similar syntaxes (for example, C# or C++). The course begins with Lesson 1, “From an OO design pattern to a functional foundation.” This lesson examines solving a seemingly simple problem using regular object-oriented approaches. The discussion develops an increasingly flexible solution, which forms a bridge to a key pattern in functional programming style. Lesson 2, “Building more functional concepts,” starts by looking at where code should be located for maximum maintainability. In the process, the discussion discovers how behavior can be passed into and out of methods. This lesson investigates the singleton and the factory; and compares those with constructors. It reviews many syntax features, including nested classes, private nested classes, and anonymous inner classes. It then introduces lambda expressions, their requirements, and syntactic variations. This lesson also looks at writing generic methods so as to create even more general code, and get the benefits of consistency checking through the compiler. Lesson 3, “The power of combinations and modifications,” extends the idea that behavior can be passed as an argument to, and returned from, a method to show that such behavior can actually be computed, rather than fixed. This lesson shows how to build behavior out of other existing behaviors, modify existing behaviors, and combine them in new ways. As a result, you’ll learn to re-use code at the level of a function, rather than at the level of a class or object. Lesson 5, “Streams API,” takes the monad concept learned in Lesson 4 and completes your understanding, so you can use the Streams API to solve potentially large-scale data processing problems. Lesson 6, “Advanced patterns and exception handling,” looks at the problem of how to handle exceptions that might arise during stream processing. In building the story, you’ll strengthen your understanding of how function composition and adaptation is used to solve real programming problems.